Sometimes people think that healthy means tasteless, and that by eating a healthy meal, you automatically have to sacrifice the deliciousness of your food. WRONG! 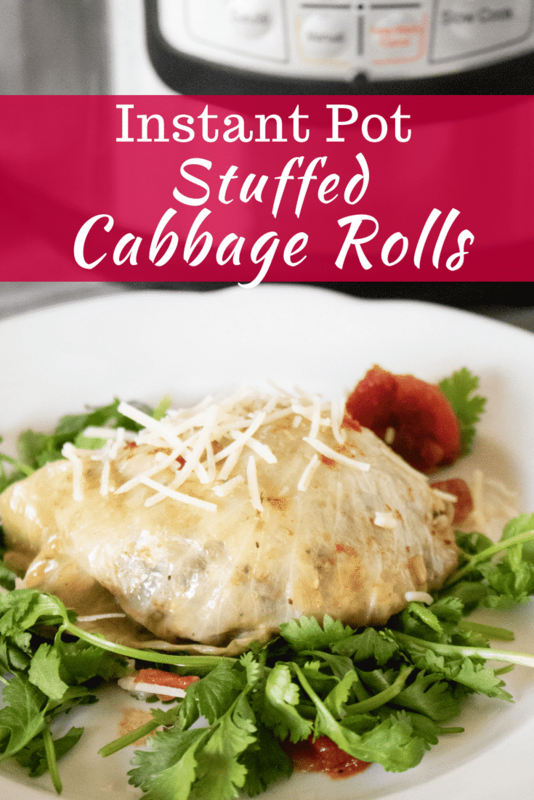 Instant Pot Stuffed Cabbage Rolls are an amazing, flavor-packed meal that is also super healthy! 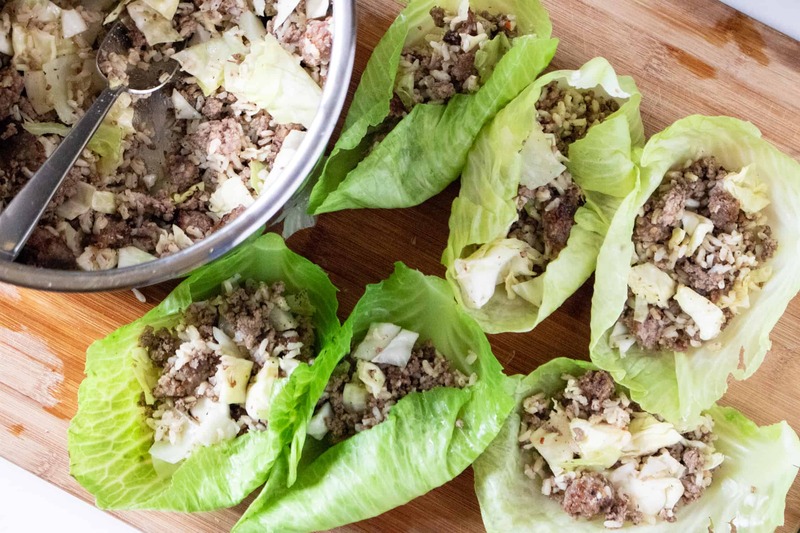 You’ll love the hearty, satisfying taste of hot Italian sausage, ground beef, rice and cabbage all wrapped up in a cabbage leaf and then cooked in a zesty combination of tomatoes and green chiles. And thanks to the Instant Pot and the steamy environment that pressure-cooking provides, your assembled rolls will turn out perfectly soft, moist and tender every time. 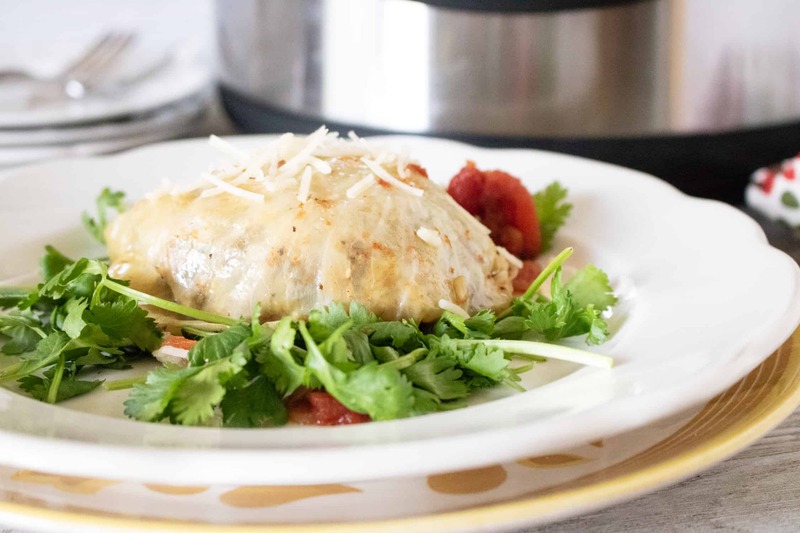 These Instant Pot Stuffed Cabbage Rolls are simply delicious, and every bite is packed full of savory flavor! #1: Easy to customize! We think the hot Italian Sausage gives them just the right amount of kick, without being too overwhelming. But for those who don’t like things that are spicy, the heat level of this recipe is quite easy to alter. Simply swap in a mild Italian sausage to replace the Hot Italian sausage that this recipe calls for. #2: It’s an all-in-one meal! 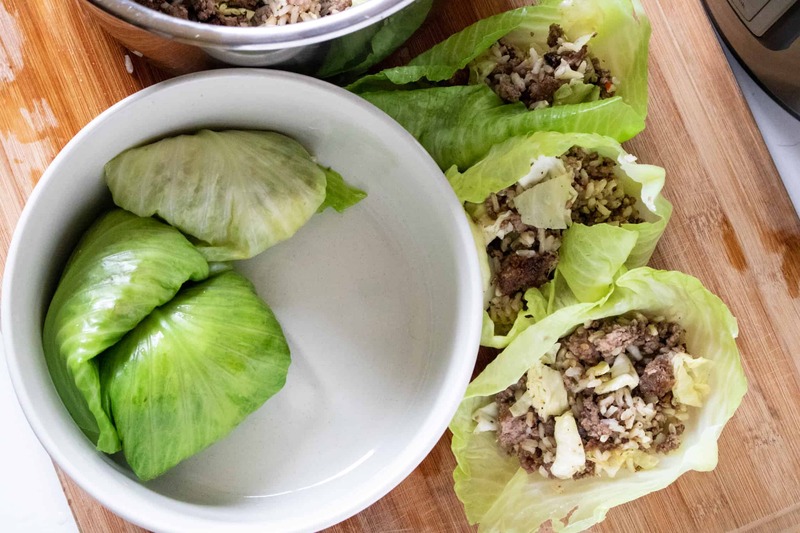 Each cabbage roll provides a good portion of rice, meat, and veggies, making this a nicely balanced, all-in-one meal that is a perfect choice for busy weeknight dinners. #3: They’re so healthy! One serving of Instant Pot Stuffed Cabbage Rolls contains just 10 grams of fat, 23.1 grams of carbs and 233 calories. Plus, they are a good source of protein, with 13.2 grams per serving. Instant Pot Stuffed Cabbage Rolls can also be served alongside delightful side dishes such as these Easy Yeast Rolls or an Easy Green Bean Salad with Tomatoes and Feta. And, this Frozen Strawberry Layered Dessert is a perfectly sweet treat that nicely complements these spicy, zesty cabbage rolls. Step #1: Put a pot of water on the stove to boil. Step #2: Remove core from cabbage and put head of cabbage in the boiling water for five minutes. Then peel the outer leaves from the cabbage and set aside. Leave the cabbage to boil for a few more minutes and then remove more cabbage leaves. Step #3: Turn on the sauté mode on the Instant Pot, and add in the sausage and ground beef. 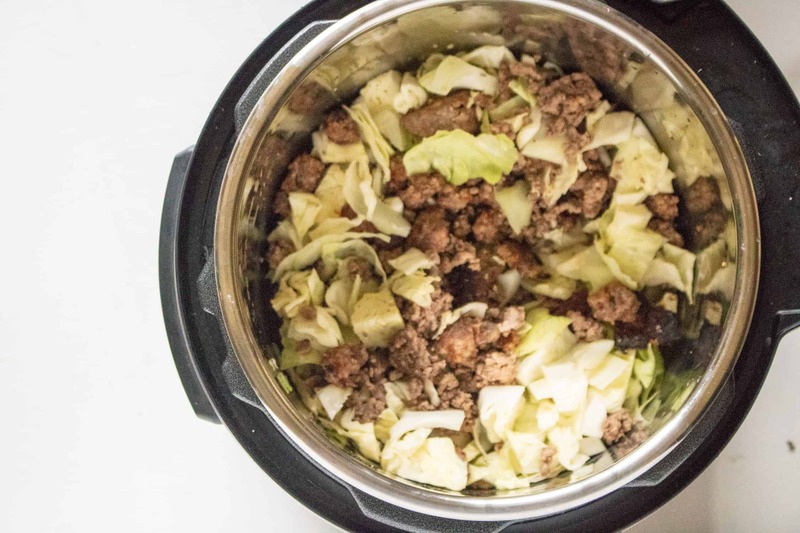 Chop up any remaining cabbage and add it to the meat in the pot. Next, mix-in the cooked rice. Step #4: Lay cabbage leaves out on a large surface and stuff with meat and rice mixture. Fold the ends of the cabbage leaves over and then roll them up. Step #5: Place the rolls in an oven-safe dish that will fit inside the Instant Pot, with the folded side of the rolls down. 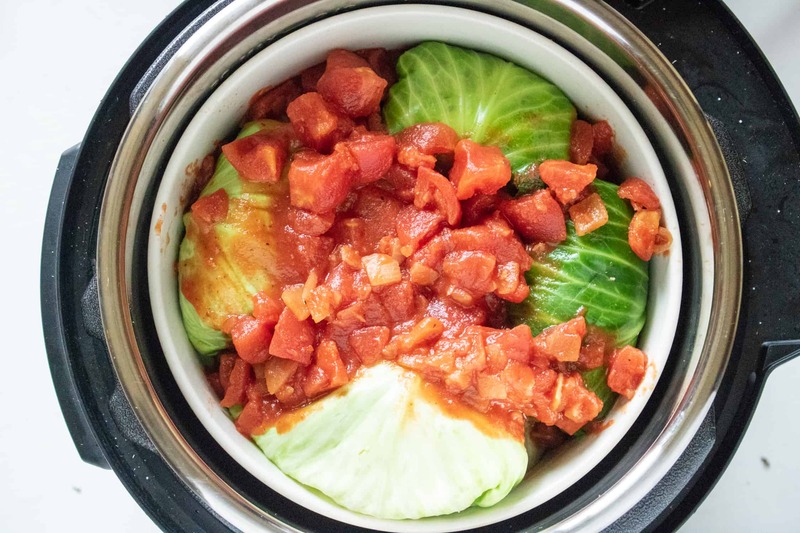 Step #6: Add 1 ½ cups of water to the inner pot of the Instant Pot, then pour diced tomatoes over the cabbage rolls, and place the dish on trivet inside the Instant Pot. Step #7: Close the lid of the Instant Pot and then turn valve to sealing position. Step #8: Set for a manual high-pressure time of 25 minutes. When the time has finished, allow for a natural release. Step #9: Serve with additional rice, if desired, and enjoy! 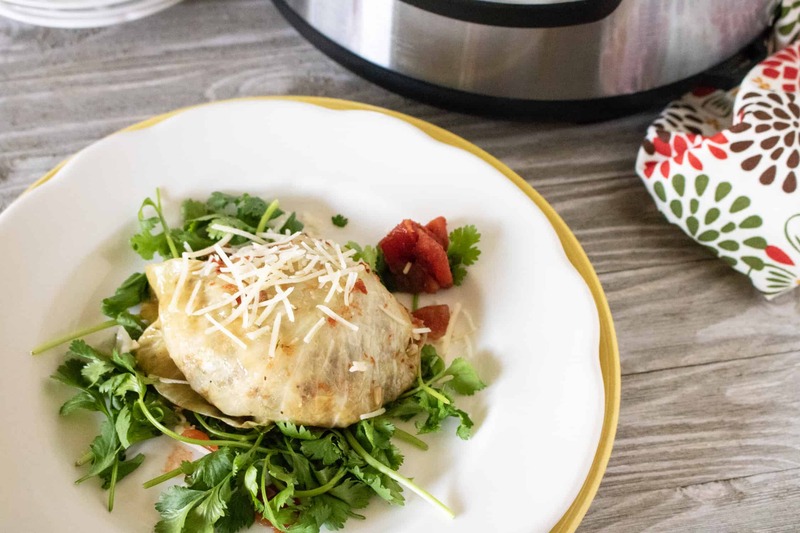 These healthy and delicious Instant Pot Stuffed Cabbage Rolls are a great all-in-one meal! Remove core from cabbage and put head of cabbage in the boiling water for five minutes. Peel the outer leaves from the cabbage and set aside. Leave the cabbage to boil for a few more minutes and remove more cabbage leaves. Turn on the sauté mode on the Instant Pot and add sausage and ground beef. Chop up any remaining cabbage and add it to the meat in the pot. Mix in cooked rice. Lay cabbage leaves out on a large surface and stuff with meat and rice mixture. Fold the ends of the cabbage leaves over and roll up. Place rolls in an oven-safe dish that will fit inside the Instant Pot, with the folded side of the rolls down. Add 1 ½ cups of water to the inner pot of the Instant Pot. Pour diced tomatoes over the cabbage rolls and place the dish on trivet in the Instant Pot. Close the lid of the Instant Pot and turn valve to sealing position. Set for a manual high-pressure time of 25 minutes. When the time has finished, allow for a natural release.